We are taking our never-ending story about The Future of Building Automation and Creating our new persona "Building Emotion" to Atlanta AHRExpo.com January 2019. Last January we were talking about Transforming our industry with IoT at AHRExpo Everywhere you look at AHR Expo 2018 you see the transformation of products and services; our complete industry intertwined and transformed with the Internet of Things (IoT). We are now planning our education sessions for the 2019 event in Atlanta. If you have been reading our never-ending story, you have been part of what we the industry are planning to talk about. The 2019 Show will be held in Atlanta, hosting more than 2,100 exhibitors and attracting crowds of more than 60,000 industry professionals from every state in America and 165 countries worldwide. The Show provides a unique forum for the entire HVACR industry to come together and share new products, technologies, and ideas. This bit of history from 2000 provides insight into our strong connection of AutomatedBuildings.com and AHRExpo.com. I have been on the leading/bleeding edge of the building automation industry for over 35 years. I have seen pneumatic control give way to electronic, electronics turn into mainframe computers as big as refrigerators, mainframes give way to minicomputers the size of suitcases, minicomputers evolve to stand alone panels the size of clipboards which gave away to micro panels the size of pocket calculators, and now input and output devices become addressable. Now that the hardware had virtually disappeared and the migration of DDC control to the Internet had started it seemed that the next edge was here and I had better get on with my life's vocation of catching up. Digital Dinosaur Does Dallas could have been a title for a low-grade horror movie but proved to be a significant growing point for us. Our involvement in The State of the Art Building Automation session at the AHR EXPO Dallas 2000 show helped us both inform and be informed about the rapid web growth as well as the exciting topics of evolving communication standards. We discovered that our greatest asset was the fact that we dropped out of the sky without the normal connection to large manufacturers or publishers. Once we convinced the industry that our intentions were honorable and that we wanted to build an automated building web resource the support was phenomenal. For more about the early years. 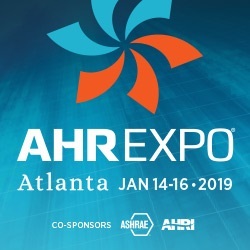 That is more than you wanted to know...big smile but here is a sneak preview of our 20th year sessions submitted for Atlanta AHRExpo 2019 you will recognize some of the evolutionary mash-up you have been witnessing in our columns. Session Description - Learning Emotion by Looking, Listening, Feeling, Thinking before returning a mindful reaction in a Humanistic User Experience "HUX." "Emotion" is the noun used to describe the creation and depiction of a mindful interactive relationship — the conversation if you will — between the inhabitants and their physical building. It is a virtual identity, a feeling, a learning, an interactive piece, a virtual brick-and-mortar that hosts the buildings' emotion. "Building" is the verb or noun that modifies it. A mash-up of a fixed physical asset and its emotional contents creating the new Building Emotion identity. ”Deviceless” mentality is an idea, that users, meaning humans, wouldn’t have to use devices, apps or interfaces to access smart services. The method of access was suggested as anything from mobile phone's presents to facial recognition. The underlying idea being that the creation of intelligence is hidden away in the engine room, always there and always on, but never visible to the user. This idea seems to arise from a widespread frustration at countless apps and interfaces we need to create our present human interfaces. The building blocks of digital transformation are; mindset, people, process, and tools. Note that tools which equal technology is the last item. We as an industry tend to focus on this first then try to trowel over mindset, people, process. This is not working. Learn how to think more like software developers creating an Awesome User Experiences for the mobile inhabitants of our buildings. We need to understand better how to be agile and sensitive to Humanistic Digital Inclusion on our new road to people-centric buildings. Humanistic Digital Inclusion is the new road that winds through our old building-centric thoughts while taking us to the new world of people-centric buildings. How might we best achieve the necessary intellect and emotional intelligence for our implementations? We need to grasp the feelings of the people with empathy in our buildings and somehow incorporate those feelings into our evolving digital twin models. Session Description - Ken and Lawrence will discuss with you "To succeed at digital transformation, instead of making humans more technical, we need to make technology more human." Session Description, - Our BAS evolution is closely coupled with the internet. What has changed in the 20 years of the Internet? Cost is down; speed is up, everything has an IP address, the Internet has become clouded with powerful microcomputers that are out on the edge, self-learning and sharing their intelligence with everyone – and everyone is continuously connected. This is AutomatedBuildings.com 20th year of providing education sessions at AHRExpo, and during that period a lot of evolution has occurred. Therese, Brad and I will pull from this evolution timeline the significant events and milestones that are like to be part of our next 20 years. Brad joined the evolution at the halfway mark so provides a different a new perspective on our history. Instead of trying to make humans more technically savvy, make technology more human. Come and join us, it will be a fun and a great industry discussion providing insight and generating a new conversation. Session Description - How do we best "Look" with rapidly evolving video analytics, "Listen" with natural language interaction and learning, using the personal assistants that are evolving as part of our edge-bots? Use our history of "Feeling" temperature, humidity, occupancies, etc. and best combine this all with 'Thinking" that will come from self-learning. Once complete we need to work a lot harder on returning that "Mindful Reaction" in the creation of an Anticipatory Humanistic Relationships. Session Description - This panel session will provide an interactive analysis of the attributes of successful Master Systems Integrators (MSI), the challenges they face and how to overcome those challenges to develop into a “Super” MSI! Staffing is proving to be a growing issue within the industry, and the panelists will explore how to find the right people, how to bring them into this industry properly, and how to continue to develop them to build the foundation for the greatest chance of success. The discussion will take a step further and dive into the business of MSI. Panelists will show examples of different types of MSI contracts/projects and break down the MSI cost and profitably against the original proposal to demonstrate what types have proved profitable and which have not. By staying at the forefront of staffing and optimal business objectives, companies have the opportunity to develop Super MSI’s that set themselves apart and create huge value on projects within standard budgets. Session Description Today’s equipment systems produce vast amounts of data. In order to utilize this data effectively to be useful to downstream applications like analytics, security compliance, work order tracking, and more, the data must include information to describe its meaning. Today, most operational data has very limited descriptive information requiring a manual, labor intensive process to "map" the data before value creation can begin. The practice of applying descriptive information to data is referred to as data semantics. Since the ASHRAE announcement of BACnet/Haystack/Brick collaboration, there is a lot of movement on tagging among manufacturers. There is a mix in the level of tagging support each vendor now has for the Haystack library and the BACnet approach, but, there is no pushback regarding the need to support standardized tagging. They are either already doing it, or it is on their roadmap. They all understand this is where the industry is headed as the industry learns to utilize smart device data to reduce operating costs and create value for building owners and operators. This session will introduce Project Haystack, the open-source initiative which is recognized as the most developed and deployed solution for “marking up” equipment system data. Examples of the use of data tagging in navigation, control, graphics, analytics, and reporting will be covered. The session will also include an overview of the work of the Project Haystack community to advance Haystack tagging as the "markup language" for device data. Very pleased to be working with a group of less that forty-year-olds on a new education session for Atlanta “Next Generation HVAC Controls: Open Hardware – Open Software.” very interesting perspective on our future. Evolving thoughts, like Voice and Text will become part of the new open standards when coupled with Underlying tagging, one API, and getting the data to and from the building in a standardized way. A discussion of (micro PCs) their potential for doing control or IoT. Mixing open standards together towards the goal of hardware agnostic controllers will be some of the evolving thoughts. 7th Session, Next Generation HVAC Controls: Open Hardware – Open Software. Session Description Truly open hardware and software is common in many industries but has only made relatively small inroads in the world of building automation where proprietary solutions still reign supreme. Open standards like BACnet enabled a revolution in open communications, but the vast majority of building automation software and hardware is still closed. The rise of software focused building analytics solutions is shaping up to be a key driver of a shift to open source. Tools such as Volttron, UT3, ECAM+, and Grafana, just to name a few, are already making data much more accessible. These tools will start to become the basis for commercial products and services in much the same way that software like Linux and mySQL now provide the basis for many traditional IT systems. There is a need to have low-cost access to BAS data to help engineers with building optimization. Having open source software with the core functionality we need has proven to be a more cost-effective and durable solution to our problems. This is a game changer for our industry and we’re only starting to see how embracing open source can lead to a tremendous boost in innovation, especially among those organizations with only modest resources at their disposal. The range of available today's (micro PCs) Raspberry, beagle boards, Dingo etc their potential for doing BAS control and deeper self-discovery mixing existing open standards together towards the goal of hardware agnostic controllers will be some of the evolving thoughts. The Project-Haystack Sandstar solution will be discussed. A look into how open programming languages like Python, C, and Java are opening our world. Evolving IoT trends like Voice and Video analytics will be mentioned. Although Amazon and Google are not open standards their open services are shaping our future. AutomatedBuildings.com is very pleased to introduce this amazing panel of less that forty-year-olds for this new first ever education session for Atlanta a very interesting perspective on our future by those that are now creating it. We have been very busy planning for this event. It will be a fun event when the softer kinder Ken will spread his message "We need to empathically grasp the feelings of the people in our buildings and somehow incorporate those feelings in our evolving digital models." Building Emotion. In the hard reality of our industry and the real world of contractors these humanistic processes have been removed. Change is coming but it is hard and slow.